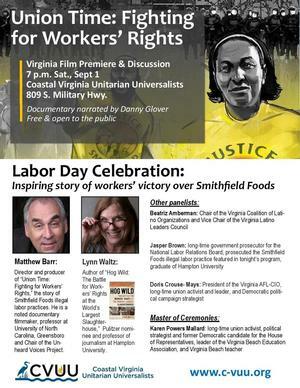 HAMPTON, Va. (August 27, 2018) - This Labor Day will be a celebration like no other as Virginia will premiere and discuss “Union Time: Fighting for Workers’ Rights,” a documentary narrated by Danny Glover. The discussion portion of the evening will consist of five panelists, including Assistant Professor Lynn Waltz of the Hampton University Scripps Howard School of Journalism and Communications, and Hampton University alumnus, Jasper Brown (‘69). The documentary, “Union Time: Fighting for Workers’ Rights,” follows the story of workers at the Smithfield Foods Pork Processing plant in Tar Heel, North Carolina, who fought for safe, fair working conditions and won. The movie shows how people standing together can break the cycle of poverty and injustice, and demonstrates the convergence of labor rights and civil rights, carrying on the legacy of Rev. Martin Luther King, Jr. Both Waltz and Brown will be panelists during a discussion at the showing of the documentary. Jasper Brown, Hampton University alumnus (’69), is a long-time government prosecutor for the National Labor Relations Board and prosecuted Smithfield Foods’ illegal labor practice. His Smithfield Foods case was one of the largest labor cases in the history of the labor board. One of his most outstanding cases was against Holly Farms Tyson in North Carolina involving 200 truck drivers who were terminated. Brown won this case and all 200 workers were ordered to be reinstated with back pay. “During this panel discussion, I’m going to share some of my experiences. That’s something I enjoy doing, passing on my practices. Those who follow me can learn some things with what I’ve experienced. I was taught to give back. My mentors taught me the value of sharing your experience with others, and I truly don’t believe that anyone has ever reached success by themselves,” said Brown. The Virginia Film Premiere and Discussion will be held on Saturday, September 1, 2018 at 7:00 p.m. at the Coastal Virginia Unitarian Universalists, 809 S. Military Hwy., Virginia Beach, VA, and is free and open to the public.